Over the years several recordings have been made which cover different periods of the Choir’s existence from 78s, through vinyl LPs to Cassette Tapes and CDs. 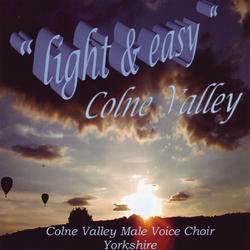 Recent CD recordings have been “Romantic Colne Valley, “light & Easy Colne Valley”, “Sacred Colne Valley” with Marsden Band featuring many well-loved hymns and sacred songs, and live recordings of the 2004 and the 2005 Christmas concerts at Huddersfield Town Hall with Grimethorpe Colliery (UK Coal) Band. These and others are available direct from the Choir. Digital enhanced CD recordings of original vinyl LP records of the Choir from 1968 and 1970 have recently been professionally re-produced and these are available on a special value double CD from commercial record outlets and the internet. The Choir regularly introduces some lighter items into its concert programmes and highlights its musical versatility. It was decided to undertake a recording completely made up of such items and as a result nineteen are featured on this recording. The title of the CD was especially chosen to reflect this lighter and popular mood and the outcome is a very listen-able, exciting and enjoyable CD indeed. 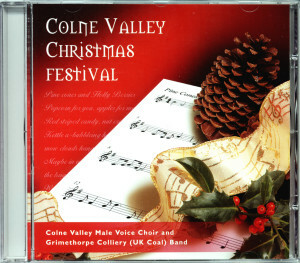 Second live recording of Concert with Grimethorpe Colliery (UK Coal) Band, on Sunday 11th December 2005 in Huddersfield Town Hall . Band: Los Hermanos de Bop, Sleigh Ride, Virtuosity, Clog Dance, Humming Chorus (Madam Butterfly), The Swan (Carnival of the Animals), Christmas Festival Overture, Troika (Midnight Sleigh Ride), Away in a Manger. Choir: On this day Earth shall ring, See amid the Winter’s Snow, O Holy Night, Pine Cones and Hollyberries, Wassail Song, The Star of Bethlehem, The Morning Star, We need a little Christmas, The Lost Chord. Let there be Light, Thank you my Lord, Jesus Shall Reign, I Was Glad, Take my Life, My Lord What a Mornin’, The Holy City, The Lord’s Prayer (Fanshawe), In Heavenly Love Abiding, The Old Rugged Cross, Breathe on me Breath of God, I Hear thy Welcome Voice, God is Working his Purpose Out, Give me that Old Time Religion, Praise the Lord his Glories Show, You’ll Never Walk Alone, Fourfold Amen. 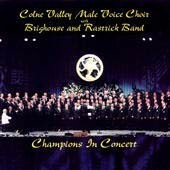 Double Album available from commercial outlets (stores & internet), not direct from the choir. Disc One: Drinking Song, Rolling Down to Rio, When I think upon the Maidens, Go Lovely Rose, Uist Tramping Song, Sacramento, I dare not ask a Kiss, Simon the Cellarer, The Old Brigade, The Song of the Jolly Roger, The Two Roses, The Silver Birch, Linden Lea, The Sailors’ Chorus, The Happy Wanderer, My Love is like a Red, Red Rose, Comrades in Arms. Recorded in 1970. 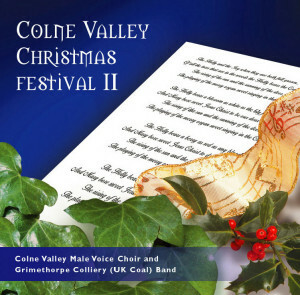 David Hirst singing with Colne Valley Male Voice Choir, Grimethorpe Colliery Band and the audience at the Christmas Festival Concert in Huddersfield Town Hall, West Yorkshire, England..
Colne Valley Men went on another recruitment tour for our CV Boys’ choir. In half a dozen local primary schools we had a great time singing with the kids and encouraging Boys to join us.